Oxford University’s department of child and adolescent psychiatry has discovered that children who spend time in nurseries are more likely to develop behavioural and emotional problems. This will confuse and depress working parents and encourage them to drink more. Perhaps the department is on a commission from a winery. Honestly, cavemen academics didn’t keep having these studies about parenting. And yet their children evolved and invented all the lovely wine. Mmmmm. What type of nurseries are the department of child and adolescent psychiatry on about anyway? Cannabis ones? Or ones that sell those gnomes that wouldn’t look out of place in splatter films, and come alive at night to misbehave and move plant pots around, torture cats and urinate everywhere? That’s what gnomes do if they’re in nurseries. 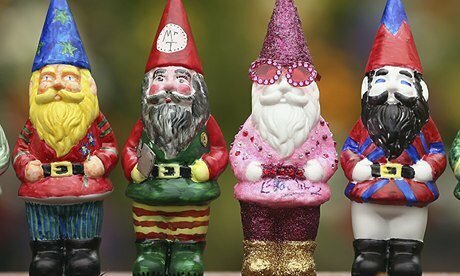 Whereas gnomes who stay at home in their own gardens with their gnome mothers behave much better and have fewer emotional problems. There’s no place like gnome. Or so says the study. Though it does cast doubt on the value of gnome schooling. I’m not reading any more of these contradictory studies. Weren’t we all told by a different study that it was better for our children to mix with other children? If children aren’t supposed to be in nursery, according to this study, and not be at home because of that other study, is there a third option that’s being kept secret by the super-rich? Are there some other children in a different place, away from all of ours? Are they in a chocolate factory? Or in Loompaland? Or in a cave beneath the medieval German town of Hamelin? The report, in the journal Child: Care, Health and Development, comes free with a set of Oxford Landing branded wine glasses, and found that the strongest influence on children came from within the home itself. Does it? Why are they blaming nurseries then? I’m completely lost now. It must be all this wine. It also found that children from poor families with high levels of parental stress were most at risk of emotional problems by the time they go to school. I’m certainly at risk of emotional problems by the time my children go to school. Luckily there’s all this wine. So, poverty leads to childhood emotional problems. Predictably, it’s the poor’s fault again. Might it be possible to get through just one week without blaming the poor for everything? It’s starting to really depress me now. And that only makes me drink. I’m beginning to think this government and the rightwing press have some sort of agenda when it comes to Britain’s poorest. Climate change? It’s the poor’s fault, warming their outstretched hands on those braziers, and not separating out their household waste properly. There is no waste. And no household. You’re supposed to recycle that box – not live in it! A meteorite lands in Russia, injuring 1,000 people. That’ll be the poor again, up there in space, being poor, trying to find themselves alternative renewable energy resources to heat up their tinned food. Michael Douglas and Catherine Zeta-Jones’s marriage crisis? Jones blames the problem on Douglas’s historic addiction to staring at people poorer than himself. Which was everyone. There is no mention in the study of the behavioural and emotional problems of the children of the rich, who spend their childhoods being cared for by others until they’re old enough to be sent off to boarding schools and whipped. Perhaps this would explain the cabinet’s lack of emotion and inability to play well with others, such as women and the general public? Childcare providers reject these findings. Anand Shukla, of the Family and Childcare Trust, said: “Research shows children who attend nursery are better prepared for school and have better social skills such as co-operation with peers.” Plus, their parents drink less Oxford Landing because they haven’t got them all day. So – and I’m no Oxford academic so bear with me – from what I can work out, we shouldn’t put our children into nurseries because they will have emotional and behavioural problems, but we shouldn’t stay at home with them either. If we could also try not to be poor, stressed out or have any mental health problems ourselves, that would be great. Elizabeth Truss, the education and childcare minister, said that large numbers of children in childcare were “running around” with “no sense of purpose”. Should a child have a sense of purpose? I’m 42 and I haven’t got one. If I did, I probably wouldn’t have had children in the first place. And then I wouldn’t need all this wine, hidden in different rooms all around the house. And in my bag. John Wilmot, second Earl of Rochester, famously said: “Before I got married I had six theories about raising children; now, I have six children and no theories.” And he wasn’t even poor. My own father, who had nine children, only gave me one piece of parenting advice: “Don’t read anything.” But my father is a Catholic and very suspicious of any books that aren’t in untranslatable Latin. All parents feel guilty all the time about every decision they make concerning their children’s lives. We’re all winging it. The majority of children in nurseries and with childminders are there because their parents have to work and have no other option. These studies make us feel even more confused than we do already. I blame the poor. What are we supposed to do? Where’s that wine?